Egypt partially reopened its border crossing with the Gaza Strip on Wednesday, a week after it was closed in response to a deadly attack on an Egyptian military headquarters near the frontier. Witnesses said two buses took 100 passengers into Egypt through the Rafah crossing, the main window to the world for the Gaza Strip's 1.7 million Palestinians. Hundreds of other people waited outside the gates for a chance to enter Egypt. Officials of the Palestinian Authority, the West Bank-based rival of Gaza's Hamas Islamist rulers, said Cairo agreed to open the crossing for four hours on Wednesday and Thursday at Palestinian President Mahmoud Abbas's request to address the humanitarian needs of patients seeking treatment in Egypt and of students studying there. Since Mursi's removal, Cairo has shut Rafah three times. Thousands of Palestinians have been stranded in the Gaza Strip for weeks. When Rafah has been open, Egypt has limited the number of passengers allowed through each day to 300 compared with 1,200 before Mursi was removed. 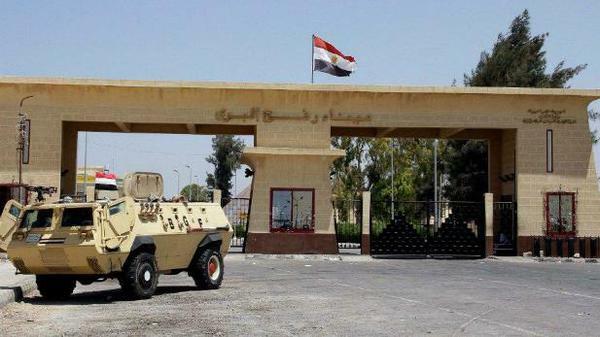 Egyptian authorities last shut Rafah a week ago after assailants crashed two explosive-laden cars into a security building adjacent to the border zone, killing six Egyptian soldiers. The lawless Sinai peninsula has seen frequent battles between the Egyptian military and Islamist gunmen. Egyptian officials have accused Hamas of aiding the Muslim Brotherhood in Sinai - an allegation the Palestinian group denies - and say restrictions at Rafah were linked to the security situation in the peninsula. In addition to the clampdown at Rafah, Egypt has been waging a campaign to destroy the network of smuggling tunnels that delivered weapons and goods to the Gaza Strip, which is partially blockaded by Israel. With the tunnels shut, prices for consumer items have risen in the enclave. Cheap Egyptian fuel is in short supply, with hours-long lines each day at Gaza petrol stations. Israeli fuel is available - at double the price of the Egyptian product.